Product #6071 | SKU 2934H00010 | 0.0 (no ratings yet) Thanks for your rating! 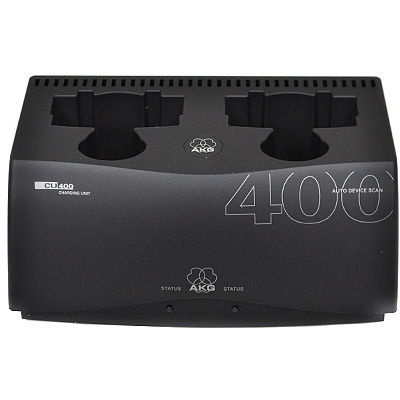 The AKG CU400 2-Slot Charging Unit for WMS450 and WMS470 Transmitters is a drop-in-style battery charger for WMS450 and WMS470 series wireless handheld and bodypack transmitter units. The charger is designed so that the integrated charging contacts of the transmitter allow the battery to be charged without being removed from the transmitter. The CU400 monitors battery voltages and temperatures during charging and automatically ends the cycle when the batteries are fully charged. The CU400 provides tricolour status LEDs in front of each charging slot to indicate the operating status of the charger.